Known for their green rolling hills and rugged coastal features, Ireland and Northern Ireland are home to over 400 golf courses. On Golf Monthly's list of the UK and Ireland's Top 100 Golf Courses 2017/18, 21 of the top courses are located in Ireland and Northern Ireland. And every course is available to be played by visitors to the Emerald Isle too! There are records of golf being played in Ireland dating back as far as 1852, and some of the island's oldest courses are still in use today. 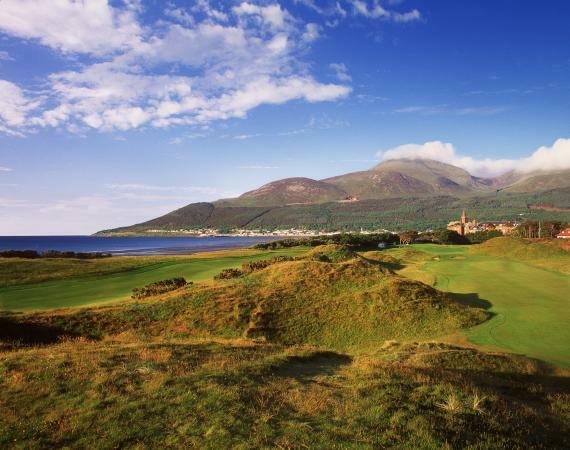 Northern Ireland's Royal County Down was named by GolfDigest as the #1 course in the world. It dates back to 1889 and is located in the Murlough Nature Reserve along the Irish Sea's Dundrum Bay, offering views of the Mountains of Mourne. Visitors are welcome to play Monday, Tuesday, and Friday mornings and afternoons, as well as Thursday mornings and Sunday afternoons. From May to October, green fees are £210 per round on weekday mornings, £200 on weekday afternoons, and £220 on Sunday afternoon. The top course on the list in the Republic of Ireland is Portmarnock Golf Club's Championship course, which opened in 1894. Located in County Dublin, only around 15 minutes from Dublin Airport, Portmarnock was the setting for the first Irish Open in 1927, and has hosted numerous other events over the years. Green fees, including lunch, are €200 Monday through Thursday, €225 on Friday and Sunday. The course is very challenging, as summed up by pro golfer Tom Watson, who said, "There are no tricks or nasty surprises, only an honest, albeit searching test of shot making skills." Another top course in Ireland is Old Course at Ballybunion Golf Club, dating back to 1893. Ranked #15 on the Golf Monthly list, the course starts off slowly, but offers players one of the best back nines in all of golf. The course is challenging during good weather with a gentle breeze, but beware when the winds are stronger. During the high season of May to October, green fees are €190 on Monday through Friday mornings. 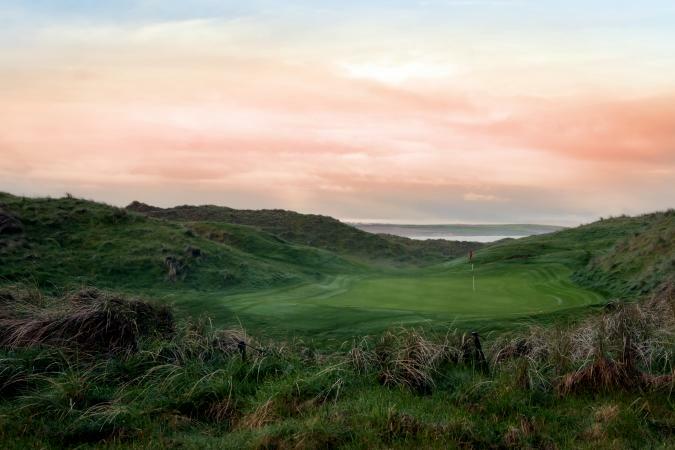 Weekends are reserved for members of the Ballybunion Golf Club. Waterville Golf Links in County Kerry is consistently rated as one of the greatest golf courses in Ireland. Located in a remote setting where the River Inney meets the Atlantic, the course is set on duneland and surrounded by water on three sides. The front nine at Waterville are relatively flat, while the back nine wind their way through the dunes. Charlie Chaplin was known to frequent the course and the town, and an annual AM-AM tournament is played here in his name. Green fees are €150, Monday through Friday, and €170 on Saturday and Sunday. A number of companies offer golf tours in Ireland, both pre-packaged where the courses and hotels are pre-determined and tailor-made where you can pick your own courses and then include some other sites on your itinerary. Prices start at around $2,000 US per person for six days of golf at some of the world's greatest courses, along with six nights accommodation, with other options available to include some off days for other sightseeing. Golf Digest Irish Tours is run by Golf Digest magazine, and offers nine different pre-packaged courses, tailor-made tours, and concierge tours for larger groups. Their tours are usually centered on a region of the island, or combine a few courses from two different regions. Tours include luxury hotel accommodations, tee times, and transportation via chauffeured mini-coach throughout your visit. PerryGolf is the leader in luxury golf vacations, providing luxury golf tours and cruises since 1984. Piece together your own custom itinerary or enquire about one of the pre-packaged itineraries. You can choose self-driving tours or opt for a chauffeured tour for larger groups. PerryGolf will arrange all your green fees and lodging, and help tackle any issues that may arise over the course of your visit. If you'd rather plan your trip to Ireland yourself, here are some tips for organizing your own golf tour. Plan for the Weather: Weather in Ireland can be very unpredictable, ranging from calm gentle breezes to gale force winds. At times, it can be downright cold on the links. Dress appropriately, including wet weather gear to protect you from the potentially heavy rains. On the bright side, green fees are often more than half off during winter months. Choose your Region: There are a number of great golf courses in Ireland, but they may not be as close together as you might think. There are a lot of small, winding roads in Ireland, and travel times between the different courses may not be as short as they look on the map. Be sure to give yourself enough time to travel between your hotels and the golf courses. Manage your Gear: Most of the links courses in Ireland do not allow carts and are rather hilly, so be selective in how many clubs you bring, and how many additional balls, tees, and other accessories you carry in your bag. Hire a Caddy: Not only will a caddy help you with your bag, but they are also a wealth of information on the course, as well as the surroundings. 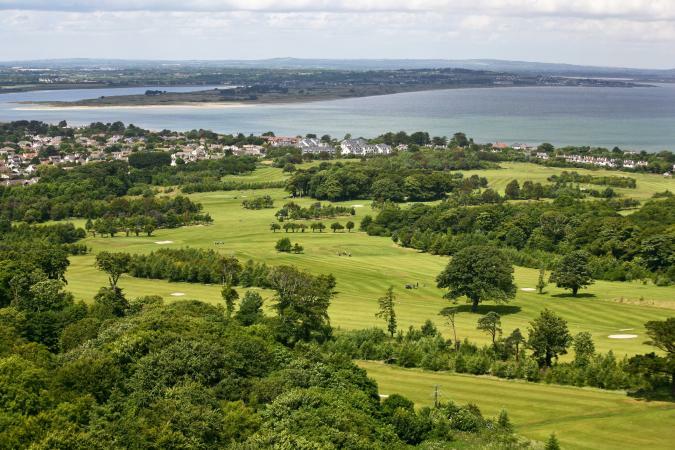 Leave the Links: Ireland is a beautiful country, and while you will experience some stunning scenery from the golf course, you will also find some of the world's most beautiful coastline nearby. Take a day off somewhere in the middle of your trip and be sure to enjoy other attractions and natural sights. Whether you choose to partake in a pre-packaged golf tour, build your own golf itinerary, or just want to play 18 holes during your visit, enjoying a round of golf on the Emerald Isle is a treat for any golf enthusiast. Between the historic courses and the incredible views, golfing in Ireland is not to be missed.